Congress Radio functioned for just about 88 days during three occasions, igniting the dwindling spirits of the freedom movement. As the nation approaches its 72nd Independence Day, we bring you stories of #ForgottenHeroes of #IndianIndependence that were lost among the pages of history. Emotions were running high among different groups representing the diversity of the Indian masses. The demand for complete independence from British imperialism was consistently ignored. To top it off, despite her colonised status, India’s participation in the Second World War was considered implicit. The leaders had had enough. It was time for the British to finally quit India. In Bombay, a young woman told her father that her education would have to wait and walked out of her home. She disappeared for nearly a fortnight, and when she resurfaced, she had helped set up an underground radio station. The young woman was Usha Mehta, who would later come to be known as ‘Ushaben’. Born on March 25, 1920, in Saras, near Surat, Gujarat, Usha met the Mahatma as a child. She grew up idolising the leader, so it was no surprise when she picketed liquor shops and lent her voice to the “Simon, Go Back!” slogan at the age of eight. She participated in camps organised by the Mahatma, where she learnt about spinning khadi cloth. Gandhian thought and philosophy would influence her through the course of her life, where she would make crucial decisions at an early age, such as remaining celibate, keeping away from all luxuries and adopting the Gandhian lifestyle of wearing clothes made from khadi. With a father who served as a judge under the British Raj, it was difficult for young Usha to freely participate in the freedom movement. When he retired in 1930, the family moved to Bombay, and young Usha joined the Chandaramji High School. It was now easier for her to distribute bulletins and publications, visit relatives jailed by the British and send them messages. Usha also resumed her education while in Bombay. In 1939, she graduated in philosophy with a first-class degree and began to study law. In the years that followed, tensions and emotions in the country grew when the British announced India’s participation in the Second World War. The Indian National Congress stepped up its demand for poorna swaraj or complete independence, because how could India, a colonised state, fight in a war of sovereign nations. The clarion call to Indian independence was blown, and the Quit India Movement was officially launched on August 9, 1942. Usha Mehta told her father that her education would have to wait and left her home to contribute to the freedom movement. For a fortnight, there was no knowledge of her whereabouts. It seemed that the British had succeeded in silencing the Quit India movement, with more than 100,000 protestors being arrested with the prominent leaders jailed or in hiding. Amidst this gloom, the words “This is the Congress radio calling on [a wavelength of] 42.34 meters from somewhere in India,” uttered by Usha Mehta echoed throughout the country. Usha had resurfaced with this secret radio station. 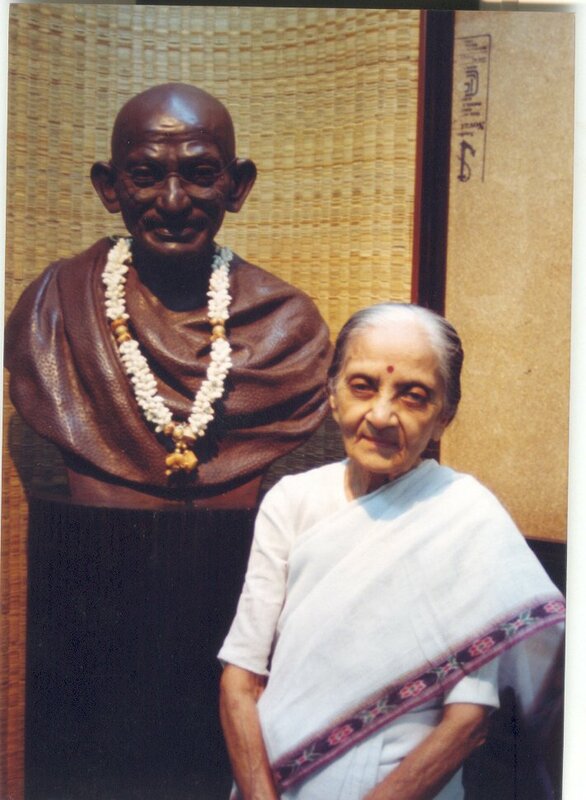 Along with her associates, Vithalbhai Jhaveri, Chandrakant Jhaveri, Babubhai Thakkar and Nanka Motwani, (the owner of Chicago Radio, and the person who supplied equipment and provided technicians), the radio broadcast messages from Gandhi and other prominent leaders across the country. There were stirring speeches from Dr Ram Manohar Lohia, Achyutrao Patwardhan and Purushottam Trikamdas, while the station also resonated with national songs. When the movement was being choked by the atrocities of the British and the vernacular press was censored yet again, the sound waves from this underground station united the people, gave them hope and strength, and urged them to continue the protest. Ushaben and her associates took care to move the location of the station almost daily, never transmitting from the same place, thereby avoiding detection by the authorities. The donations from the grain dealers, business houses, trade associations and cotton merchants of Bombay funded the station and kept it going. Despite the utmost care to maintain secrecy, Congress Radio functioned for just about 88 days, during three occasions: with its first broadcast on August 27, 1942; between February and March 1943; and for a week during January 1944. The British were desperate to find and curb the station, and this was made easier by the betrayal of an Indian technician. Usha Mehta and her associates were arrested. Although the betrayal by an Indian made her sad, she described it as her “finest moment”. She was jailed for four years because she would not answer any questions or give up the movement. In jail, her health deteriorated. Although released in March 1946, she was confined to bed and could not participate in the independence celebration that came a year later. In free India, Usha Mehta resumed her education and continued to spread the Gandhian message. She completed her PhD from the University of Bombay, where her dissertation was about the political and social thought of Mahatma Gandhi. She went on to teach at the Department of Civics and Politics at the University, finally retiring in 1980. She authored several articles, essays and books in English, and her mother-tongue, Gujarati. In 1998, the Government of India awarded Dr Usha Mehta with the Padma Vibhushan, the country’s second highest civilian award. Watch this short documentary about her. Patriotic till the end, Dr Usha Mehta breathed her last on August 11, 2000. However, her voice and her work will echo her Gandhian idealism for posterity.